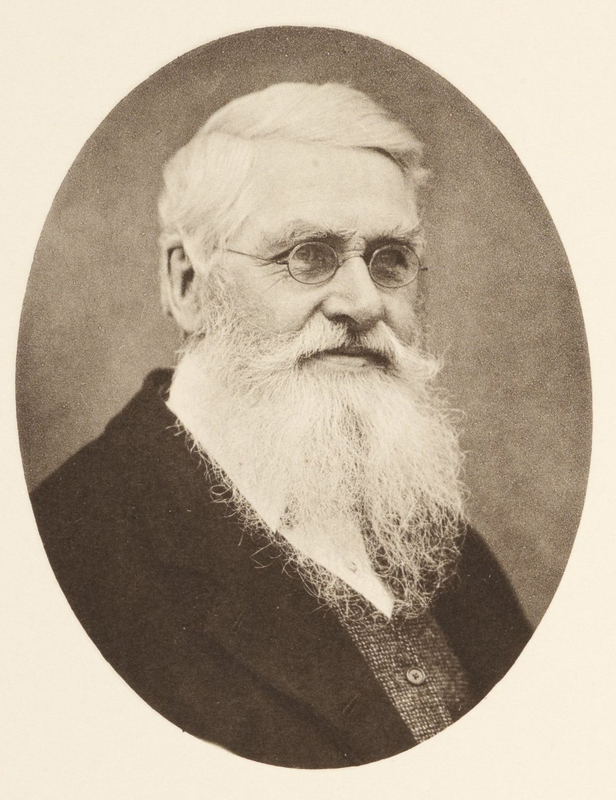 Wallace was a leading Victorian naturalist, with wide-ranging interests from biogeography and evolutionary theory to spiritualism and politics. He was born in 1823 in Usk, a small town in south-east Wales, and attended a grammar school in Hertford. At the age of 13, he was forced to leave school and enter a trade because of financial hardship. He joined an older brother in London as a builder’s apprentice, and the following year started work as a land surveyor with another brother, travelling to different parts of England and Wales and collecting plants. In 1844 he became friends with the entomologist Henry Walter Bates, and the two men travelled to Brazil in 1848 to pursue natural history. Despite losing most of his collection in a fire on the return to England in 1852, Wallace became known for his exotic specimens and was able to finance another extended voyage to Malaysia. Between 1854 and 1862, he travelled some 14,000 miles across different islands, often living with native inhabitants, and collected around 125,000 specimens, especially butterflies and birds, many of which were unknown to European science. He became one of the most well-travelled and experienced field naturalists of his day, with unsurpassed knowledge on tropic flora, fauna, and native peoples. This extensive field experience formed the basis of theoretical work, especially on geographical distribution (the so-called ‘Wallace line’ dividing Indian and Australasian faunal zones), the origin of human races, and most famously, the problem of species change. Wallace returned to London in 1862. Lacking the social connections that were still essential for securing a livelihood in science, he struggled to find a paid position, supporting himself through writing, lecturing, and the sale of specimens. He quickly established ties with other naturalists and specialist societies, worked on his large collections, and published papers on zoology, biogeography, and anthropology. He formed a close friendship with Herbert Spencer, and took up Spencer’s phrase ‘survival of the fittest’, urging Darwin to adopt it as an alternative to ‘natural selection’, which he regarded as too metaphorical and prone to misinterpretation (see letter from A. R. Wallace, 2 July 1866). Wallace became one of Darwin’s most important correspondents, especially on theoretical topics. Although the men referred to each other in their published work, letters were a space where they discussed the details of evolutionary theory, and aired their differences openly. Their correspondence is full of lively debate on the origins of hybrid sterility and sexual dimorphism, the role of sexual selection, and the limits of natural selection in the development of mental and moral faculties. Wallace first expressed reservations about the application of natural selection to ‘man’ in 1869, and looked instead to a ‘higher intelligence’ as the best explanation for the large brain of early humans, which he argued was superfluous to their needs. At the same time, he confessed his belief in spiritualism, and began to publish articles on spiritualism as a ‘natural’ phenomena, open to scientific investigation (see letter from A. R. Wallace, 18 April ). Wallace’s views on man were also consistent with his long held belief in the progressive nature of evolution, views that he had formed through exposure to the work of socialist authors such as Robert Owen in the 1840s. Despite their increasingly fundamental differences, Darwin and Wallace remained highly supportive and friendly toward each other in their letters and publications. Darwin praised Wallace’s later writing on geographical distribution, and lobbied extensively for a government pension, which Wallace received in 1881 (see Darwin’s letters to Wallace, 17 June 1876 and 7 January 1881, and the letter from A. R. Wallace, 29 January 1881). Wallace was a very forceful writer and arguer, powers that served him well in the public arena, where he was active against critics of natural selection. Wallace once described himself as a “Guerilla chief”, while Darwin was the “great General” (letter to Charles Kingsley, 7 May 1869). In later years when Darwin reflected on the events of 1858 and his many debates and disagreements with Wallace, he regarded the mutual respect and collegiality that they sustained as epitomizing how science ought to be: “I hope it is a satisfaction to you to reflect,—& very few things in my life have been more satisfactory to me—that we have never felt any jealousy towards each other, though in one sense rivals” (letter to A. R. Wallace, 20 April ). Wallace outlived Darwin by more than twenty years, writing vigorously on evolutionary cosmology, as well as socialist and feminist causes, such as land nationalization and women’s suffrage. He died in 1913 at his house in Broadstone, Dorset, the last of a series of homes that he had designed, drawing on his early experience as a surveyor and builder. The copyright in works by Alfred Russel Wallace that were unpublished at the time of his death belongs to the executors of the A. R.Wallace Literary Estate. Reports long preparation of work on how species and varieties differ. Agreement with Wallace’s conclusions as reported inAnnals and Magazine of Natural Historyand in his letter to CD of 10 0ct . On distinction between domestic varieties and those in "a state of nature". On mating of jaguars and leopards, the breeding of poultry, pigeons, etc. Requests help for his experimenting on means of distribution of organic beings on oceanic islands. Comments on agreement of their respective views on distribution. Reference to differences on subsidence. Reports on progress of his work and praises ARW’s investigations. Lengthy analysis of sources of misunderstanding of natural selection. Advocacy of Spencer’s term "survival of the fittest" instead of "Natural Selection". ARW urges CD to stressfrequencyof variations. ARW’s review of 10th ed. of Lyell’sPrinciples[see6684] is admirable. But he differs "grievously" with ARW on man. CD sees no necessity for an additional and proximate cause. Expands upon their differences in regard to man and the question of the existence of forces not yet recognised by science. Appreciation of eulogy in preface of ARW’s book [Theory of natural selection]. Response to ARW’s "grand and memorable work" [Geographical distribution(1876)]. Most interesting part to CD is ARW’s "protest against sinking imaginary continents". Informs ARW of favourable reception by Gladstone of memorial respecting ARW’s services to science, and the establishment of a pension for him. Further information about the pension with particular thanks to CD for his role.